The replacement question. One I’m often asked as the CEO of a company that offers video interviewing solutions. Are you looking to replace the traditional, in-person interview with video interviews? The short answer is: no. The main purpose of video interviews is to bridge the gap between an initial paper resume to the in-person interview. Thus, this new wave of interviewing should be seen as an enhancement to the screening process rather than a replacement to the traditional interview. There are multiple ways video interviews bridge the gap between an initial paper resume and the in-person interview. For one, video interviews enable a company to screen candidates anywhere in the world without the need for travel. Does that mean companies won’t continue to fly people in town for an in-person interview? No, but it does mean that companies will be able to make smarter decisions on who they fly in. Not to mention the benefits for the candidates abroad who may not be able to make it in town such as students studying overseas. How do you evaluate candidates and decide who to advance further along in the hiring process? If you haven’t explored online interviewing, then I’m assuming you’re still conducting those time-consuming phone screens- a topic I discussed earlier in the week in an article on why you should be conducting video interviews. While I did say that video interviews aren’t meant to replace the in-person interview, one-way video interviews are a time-saving alternative to the traditional phone screens. PLUS, you gain way more insight on candidates. On video, you see personality, energy, charisma, professionalism and most importantly, body language. 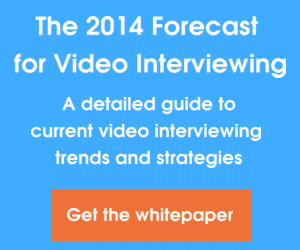 In the previous two scenarios, video interviewing helps shrink the gap. In the scenario I like to call the Tie-Breaker Gap, video interviewing widens it. In today’s ultra-competitive job market, recruiters’ inboxes are flooded with similar looking cover letters and resumes from candidates with almost identical qualifications. How do you judge one candidate versus another? One answer could be a phone screen, but we just discussed how inefficient that can be. The other option is to use video in the hiring process. For example, create a set template of questions for a one-way video interview. Send the template of questions to candidates who are similar on paper and let the tie-breaker begin. Evaluate what’s not on paper and you’ll be able to better differentiate between candidates and widen the gap between candidate A’s qualifications and candidate B’s. After examining how video interviewing bridges (or widens in the case of the tie-breaker) multiple gaps in the hiring process, one should be able to see how it can be integrated as a key piece of the screening process leading up to a traditional interview. An in-person interview is a big investment of time. The preparation, the involvement of multiple individuals, the scheduling and more can make one dread the traditional interview altogether. However, if smarter decision making is enabled by a screening process leading up to the traditional interview, then that investment of time is well worth it because it’s being spent on a quality candidate and hopefully your next superstar employee. So are video interviews replacing the traditional interview? I’ll let you be the judge.